BA's sophisticated and newly-branded 'Club Suite' offers direct-aisle access, a suite door for greater privacy and luxurious flat-bed seats in a 1-2-1 configuration. 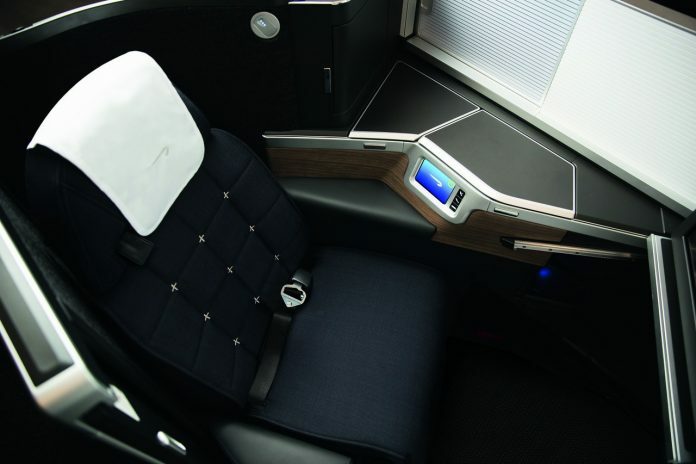 British Airways has unveiled its new business class seat – ‘Club Suite’ to be rolled out in July. The airline’s sophisticated and newly-branded ‘Club Suite’ offers direct-aisle access, a suite door for greater privacy and luxurious flat-bed seats in a 1-2-1 configuration. It also offers 40 per cent more storage, including a vanity unit and mirror, WiFi, whopping 18.5-inch inflight entertainment screens, high definition gate-to-gate programming, and PC/USB power. The A350 aircraft is designed to be calming thanks to its reduced noise levels, high ceilings and ambient lighting which is intended to compliment the time of day and outside light. Customers will leave their flight feeling rested thanks to higher levels of humidity and refreshed air as the cabin pressure is equivalent to an altitude of just 6,000 feet. There are also ECO features on the state-of the-art A350 as 25 per cent lower fuel burn significantly reduces CO2 emissions. The airline, which is marking its centenary this year, will roll out the new suites in phases. During phase one, the first A350 aircraft will start some short-haul flying between London and Madrid to allow the airline’s teams to perfect their customer service delivery and familiarise cabin crew with the aircraft layout. As part of British Airways’ £6.5 billion investment for its customers, the airline is also delivering changes to its First, World Traveller Plus and World Traveller cabins, with new restaurant-style catering from Do&Co, rolling out industry-leading Wi-Fi on board and opening new lounges across the world. New routes being launched this year include Osaka, Pittsburgh and Charleston.